Ball State University offers the only accredited planning degrees in Indiana, a state with a mix of large thriving cities such as Indianapolis and Fort Wayne and struggling rust-belt survivors including Muncie and Gary. The natural, urban, and cultural landscapes offer much to consider. The Cardinal and White River greenways come to mind immediately with a variety of vistas and interactive features along the banks and into neighborhoods. Muncie is roughly in the middle of the state’s longest trail, 62 miles from Marion to Richmond. Prairie Creek Reservoir and numerous parks add to the recreational offerings. Pocket parks and a growing interest in public art provide variety. Like most small towns, Muncie has struggled with downtown revitalization over the years. Today, lighting, wayfinding signage, buried utility lines, and attention to sidewalks and plantings have given downtown a comfortable facelift. Business facades have been restored with the help of a series of grants, and the restaurant/bar scene is thriving. Major corridors have been defined and are maintained by a corps of volunteer organizations. Like other rustbelt cities, Muncie struggles to find employment for manual laborers, and some neighborhoods have suffered as factories have moved out. The Muncie Action Plan spurs neighborhood revitalization and provides training for citizens in the visioning and planning processes. Recent projects green-lit for construction include the Kitselman Trailhead, a mixed-use development that will include a city gateway on the east side, as well as a number of recreational features at the eastern terminus of the White River Greenway. Given the variety of initiatives and opportunities, and the level of participation in which our students can engage, an education at Ball State University embedded in the Muncie community prepares students well for the diversity of contexts and scenarios that emerging urban planning professionals will face in the 21st century. You may know Muncie as “Middletown,” the pseudonym given by Robert and Helen Lynd who studied the city in the 1920s and wrote the landmark studies Middletown (1929) and Middletown in Transition (1937). These in-depth accounts of life in Muncie became classic sociological studies and established the community as a barometer of social trends in the United States. The university’s Center for Middletown Studies builds on this scholarship. Our Master of Urban and Regional Planning degree is a rigorous program supported by both studio- and policy-based curriculum that will get you out in the field working alongside communities to improve lives. You will use electives to fashion an area of expertise and will complete an internship and a research paper, creative project, or thesis that will allow you to further define yourself as an expert. You could choose to focus on design and take some electives at our Indianapolis location or opt to earn a certificate in real estate development along with your MURP coursework. We value immersive learning and include immersive learning programs abroad. Core courses include design and presentation techniques, impact analysis, social justice, planning law, and qualitative and quantitative analysis. You’ll create a portfolio of your work which will help you land a summertime internship in between your first and second years of study. 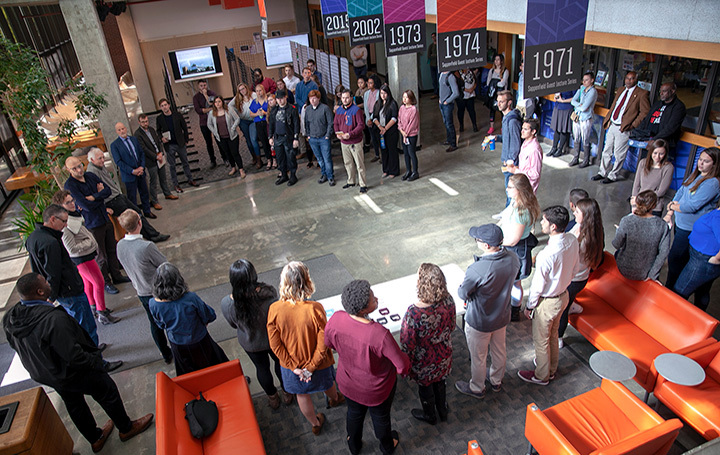 Each fall the College of Architecture and Planning takes a break from classes to embark on field trip week which allows students to experience cities from Seattle to New York with faculty guides. Each year hundreds of students from around the world study at Ball State, aided by the Rinker Center for International Programs which provides support every step of the way. Students from India, China, Sri Lanka, Saudi Arabia, and Africa have studied in our department in recent years, bringing fresh perspectives and ideas to our studies. Ball State offers an immersive English language program for students who need to brush up on language skills before tackling graduate study. All of our classes are taught by faculty who include an internationally known Asian scholar, a nationally respected housing expert and several who are heavily involved in planning and land banking in Muncie. Faculty have experience working throughout the state, and most do consulting work in planning, real estate development, GIS, or ecology, keeping them current in real-world practice. You’ll get to meet all of them during orientation and then in the classroom and are sure to find a mentor for your final project among them. Our graduates work in city, state, regional, and national planning roles, in real estate development, policy analysis, GIS, transportation planning, non-profit work, and other fields. While many stay close to home, we have alumni around the world, working, teaching, and studying in PhD programs. Ball State’s Rinker Center for International Studies stands ready to assist foreign students who wish to study with us.